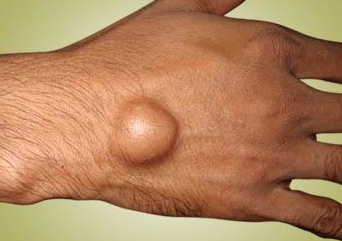 What is a ganglion or bible cyst? It is a swelling that appears around tendons and joints around foot or hand. It is formed from tissue which lines a tendon or joint. The lining of the joint and tendon is formed by synovium tissue, and its function is to produce fluid that lubricate the joints. And if the cyst which is formed by synovium is filled with jelly like fluid it is termed as ganglion.As per Dr.Abhishek, female are more prone to develop ganglion. its occurrence is more between 20-30yrs of age group, but it may occur at any age. Usually seen around ankles and wrist. Though it can occur around knee joint as well,big ganglion at the backside of knee in popliteal fosa is termed as Baker Cyst. Hyperactivity of wrist or ankles e.g. 3.table tennis players may develop ganglion cyst. The ganglion cyst appears as a small mass which changes size. Its size may increase gradually. Physical examination done by a qualified Homeopathic physician. Why Aura Homeopathy treatment for Ganglion or Bible Cyst? Homeopathy medicines is capable of treating ganglion condition that too without aspiration and surgery. Homoeopathic medicine are safe and can safely be given to children, and even pregnant females.